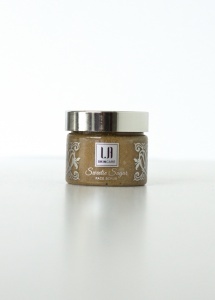 Contains natural brown sugar, as well as essential oils to leave the skin feeling soft and smooth. The granulated particles of brown sugar in the sugar scrub serve as tiny scrubbing agents to slough the dead skin away naturally, leaving skin feeling clean, fresh and revitalised. Use once or twice a week after cleansing. Using guide: Apply a small amount of scrub directly on to face and gently work into the skin using circular movements, avoiding the delicate eye area. Rinse thoroughly with warm water. Dark Brown Soft Sugar, Shea Butter, Grape Seed Oil Refined, Golden Castor Sugar, Laureth 3, Mandarin Oil Fragrance (Pure Essential Oil), Geranium Egyptian Oil, Ylang lll Oil, Papaya Extract, Basil Sweet Oil Fragrance Essential Oil, Linalool, Geraniol, Limonene, Citronellol, Citral, Farnesol, Benzyl Salicylate, Benzyl Benzoate.